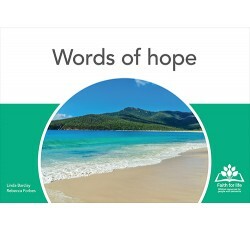 Words of hope is part of the Faith for life collection (devotional series) and pairs verses from the Bible and from well-known hymns and choruses, with beautiful images. In Words of hope, each A4 landscape card is an opportunity to consider a different aspect of God’s goodness to us. The cards can be enjoyed in one-to-one or group devotional settings, or individually. The 12 double-sided cards in Words of hope are printed on sturdy, quality art board and specially coated for extra endurance. They come in a polypropylene satchel for safe storage and transport. Faith for life card series come in a specially designed polypropylene satchel.